In the previous article: Syria: The Criminal Empire’s Strategy of Divide, Conquer and Destroy we discussed how the empire seeks to create sectarianism and ethnic divides in a country that, prior to the Western-launched criminal dirty war, had neither. In Part two we will continue to discuss how the empire is using Kurds as pawns in its imperial pursuits. *It’s important to note that whenever we are discussing Kurds in this context it is always the separatist Kurds that want to balkanize Syria and never meant as a blanket statement about the entire Kurdish ethnicity. The situation in the North East of Syria regarding the Kurds seems to be a topic of confusion for most. Understandably so as they have been made to appear by US politicians and news outlets as the most effective fighters against terrorism in Syria. Although they have in fact been successful in driving out terrorists in some areas there is information that needs to be discussed that explains the other half of the story that is purposely hidden in the Kurdish and mainstream media news outlets. We have only been hearing from the Kurdish side now it’s time for the Syrians in Kurdish held areas to have their chance to tell us about the hardships they have been put under by the Kurds. I have been actively collecting information and conducting interviews with Syrians who live in Kurdish held areas since 2015. Some reached out to me in hopes that their message will reach the West. They have read what the Kurdish and Western mainstream media news says about the situation in their area and are disheartened that the truth is not being told. Treatment of non-Kurds by the minority Kurd population in Al Hasaka (also referred to as Hasaka) governorate is unethical and criminal. The minority Kurd population in Qamishly treats the majority non-Kurd population poorly. They are trying to impose their will on everyone by force. They pretty much have the Hasaka governorate under their control and those that oppose them are usually driven out of their homes. They are monopolizing everything for themselves trying to maintain self-governance. They are placing unqualified people in positions of power, there is no law whatsoever to control the area. They are willing to take anyone who agrees to fight with them, even if they are criminals they get them out of jail immediately so that they can grow their army. PKK fighters were brought into Syria from the Qandil Mountains in Turkey and made managers and heads of institutions in the Hasaka governorate. They are very authoritative and Syrians fear them. Kurds differentiate and provide better treatment to the Yazidi and Kurds that are displaced in Syrian than the Syrian Arabs. All passages from Turkey and Northern Iraq are under Kurdish control. The Syrian government condemns separatist Kurdish ambitions and vows to keep Syria united as one country. 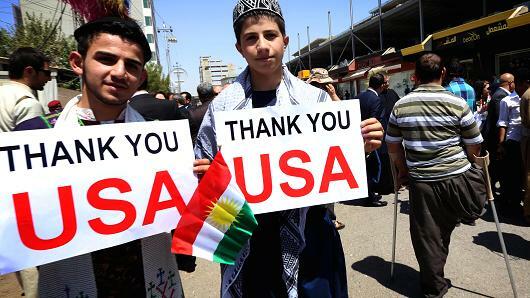 Lately, Kurds have been more vocal about their desire to create a federation. The areas they want to claim are Al-Malkiya to Efrin, the entire borderline with Turkey including Al-Malkiya, Qamishli, Hassaka, Ein Arab, Al-bab, Efrin, in addition to the rural villages. They have also mentioned that if they are able to liberate Al Raqqah they will add that to their federation. As can be seen in their SDF insignia. The USA’s support to the SDF as was mentioned in more detail in the first article which can be read here. has had a negative impact on Syrians and infringed on their sovereignty. The USA is preparing to build a second military base in Syria at Tel-Baidar. The NATO-aligned Kurdish minority corrupts the Syrian educational system. Education which was once an area of pride for the Hasaka region has now become one of the worst catastrophe’s as a result of the Kurds. They have imposed a new school curriculum unaccredited by the Syrian State. Almost all government schools are now under Kurdish control. Kurds are teaching Kurdi in all of the non-government elementary schools, next year they will implement this in all middle schools under their control and the following year their plan is to implement this in high schools as well. Syrians in Kurdish areas are not able to study in Kurdi and have either pulled their children out of the Kurdi schools or send their children to Syriac schools which have limited space, at the moment they have 1,800 students. The only other option is to send their children to schools that are government held but farther away from their homes. Even Kurdish teachers are struggling with teaching the Kurdi curriculum. There is one private University Qurtuba in the Hasaka region. Illegal Western sanctions are benefiting the un-elected Kurdish minority that is imposing its undemocratic will on the community. The general consensus of Syrians in the Hasaka area is that they feel isolated from the rest of the country. They feel that Syrians in other parts of the country do not know much about their living conditions. The only way to travel outside of the Hasaka region is via plane. The airport in Al Qamishly is operating, but until about a year ago it was simply too expensive for the average citizen to travel via air. An airplane ticket from Al Qamishly to Damascus reached 80,000 Syrian Pounds (3 times the average salary in the country) which would equate to about $160 USD. About a year ago, two new airlines started operating in Syria, so the price decreased and it became more affordable but is still out of many people’s budget. Migration has become a major issue. Just this past month, more than 80 Christian families have left Qamishli, Al-Malikiya and Al-Qahtaniya. Most of those families took asylum in Belgium, Australia, and Sweden, and most likely they will not return as long as the situation in the country unstable, said Samir one of my contacts in Al Qamishly . Al-Malkiya is almost empty of Christians now. It is estimated that 50% of Hasaka Christians have left; the majority of those who have left to Turkey were Christians (different ethnicities). Also, a fair number of Kurds also left to Turkey. Humanitarian aid is being provided by the UN, WFP, UNHCR, Armenian and Syriac churches. UN is participating is helping people; teaching governmental curriculum for free to anyone who wants it, distributing food to families in need, and coordinating with different UN organizations operating in Al Hasaka. WFP (World food program) is also providing nutritional support. Also, they are implementing development programs, like supporting bread bakeries and maintaining general hygiene. Armenian and Syriac church’s have also been helping citizens but their resources are very limited. Imperialists are instrumentalizing the Kurdish minority to balkanize Syria, to destroy its nation-state self-determination, to destroy its sovereignty, and to destroy its territorial integrity. These violations derogate international law, and undermine world peace, prosperity, and democracy. Whereas the Syrian government and its allies are aligned with the forces of international and national law and order, the West and its allies — including all of the terrorists in Syria, and a minority of the Kurdish population – continue to be perpetrators of the highest crimes according to Nuremburg principles. If the West succeeds in carving out a part of Syria, ostensibly to serve Kurdish interests, more Western military installations will be built on Syrian soil, and the Kurds will soon discover that their new polity, in whatever form it may take, will become a corrupt stooge “government” at the service of Empire. Everything laid out in this two-part article is true, of course. Readers can much more background and detail from Stephen Gowans’s blog and book. His recent book (in which he struggle to get the tense right and didn’t quite succeed, a quibble) is titled “Washington’s Long War On Syria.” Interested persons can check out YouTube videos of Stephen discussing his book if they want to get a flavor of the book before buying it. The work of independent journos like Sarah, Eva Bartlett and Vanessa Beeley, and others who are less known, is indispensable, especially as they (bravely) visit the region, or have lived there or have family or friends there, etc.. Yes, Some of the celeb journos like Max Blumenthal visit the region too, but they have connections that are worrying. I’ve been a long time admirer of Max Blumenthal and highly recommend his book on the Israeli attack on Gaza, in 2014, titled “The 51 Day War.” But the organization that gives Max his resources and platform to disseminate info is George Soros-funded. That is a big deal. And others, who pay closer attention than I do, have noticed some really stinky things about Max’s and Ben Norton’s coverage of Syria. See Barbara McKenzie’s blog. Max’s coverage of Syria, now, is probably okay. I haven’t been following him lately. One, I’m following dozens of journos. Two, I’ve lost my enthusiasm for many on the Left who have given me reasons for my disappointment. The sites that can’t give independent journos who have done nothing but honest, useful reporting, and sometimes proved to have other serious issues, have disappeared from my list of links. I’ll be damned if I’m going to reward them for their big fails.